2 Does Flour Get Old or Go Bad? 4 Can You Use Musty Smelling Flour? Flour does not stay fresh or weevil-free when it is stored on your pantry shelf in its original bag or box. Air seeps into the packaging material, and insects often find flour makes an excellent dinner and a nursery for their eggs. Properly repackaging flour in sealed Mylar bags and storing them under the right conditions will extend the lifespan of white flour from a year to more than five years. Refined white flour may be stored for up to 12 months in its original packaging. 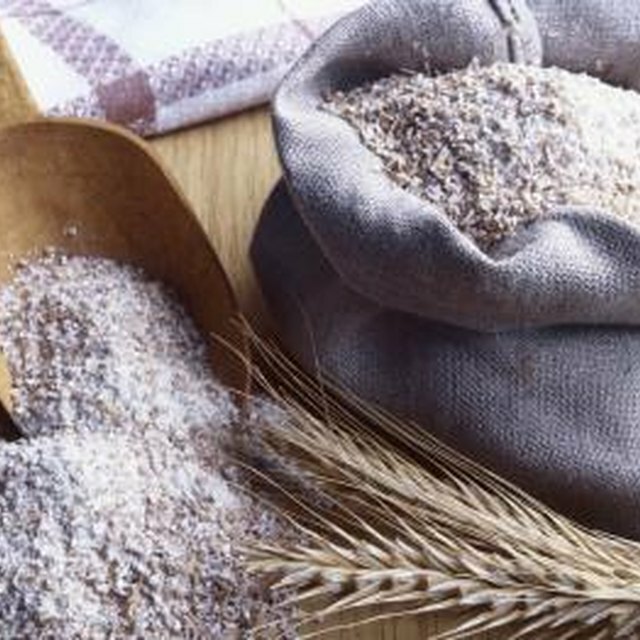 Expect whole wheat and other whole grain flours to remain fresh and usable for no longer than approximately eight months in their original bags or boxes. Supermarket packaging does not exclude air which causes deterioration in grain products. Paper bags and cardboard boxes do not protect grain products from pests such as grain moths and weevils. Using Mylar bags and oxygen absorbers extends the shelf life of white flour to about five years. Whole grain flours are not recommended for long-term storage because their higher oil content causes them to turn rancid. Mylar bags, made of laminated layers of plastic and metal foil, offer extended shelf life for flours, protecting against spoilage and insects if the bags are sealed properly. Use of an impulse tool specifically designed to adequately seal Mylar bagsis recommended because household irons and flatirons do not make a good enough seal. Securely sealed bags are less likely to leak or fail entirely in storage. Oxygen absorbers are small sealed packets filled of iron filings. The iron rusts as it reacts with the oxygen in the flour you are storing, leaving behind only nitrogen, an inert gas that occurs with oxygen in the air we breathe. Removing oxygen suspends biological breakdown of the flour and also smothers any insect eggs that are found normally in most grain products. Inert nitrogen does not react with the flour and will not support insect life. Mylar bags and oxygen absorbers are only two parts of the flour storage strategy. The filled and sealed bags should be stored in an area no warmer than 70 degrees. They should also be kept in a dark and dry area. Heat, light and moisture cause stored food products to break down more rapidly. Food in Mylar bags should not be stored directly on the floor but should rest a few inches above it. Direct contact with the floor may cause moisture condensation on the bottoms of the bags. Bags should be stored in a metal or other hard-sided container to discourage hungry rodents. Place bags of flour in the freezer for a day or two when you first bring it home from the store. This will help kill any insect eggs in the flour. Assemble all the tools you need before putting the flour in Mylar bags. Oxygen absorbers lose some of their effectiveness if they are left exposed to the air for more than 20 minutes, so work as quickly as possible when filling and sealing the bags. LDS.org: Longer-Term Food Storage: What types of food can be packaged in pouches?